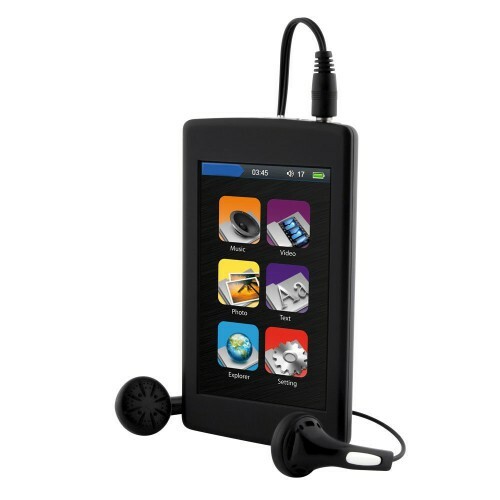 The T9 portable video audio player is the go anywhere do anything device. Playback video content, MP3 audio, read e-books, view photos images, listen to the radio or record your surroundings. Load content via a USB connection to your PC or laptop or via a micro SD card not supplied. No need for third party software, it's drag and drop from your PC. A built in gyro sensor rotates images between portrait and landscape widescreen mode automatically. A mini vibration motor confirms key presses on the super sensitive touch screen. The high resolution, high pixel count 3 inch LCD screen gives clear, sharp and high refresh images allowing you to watch video with ease. The internal Lithium Ion battery provides 3 hours of continuous playback and can be quick-charged at any time without battery memory effect.